Jon Klassen | are you sitting comfortably? 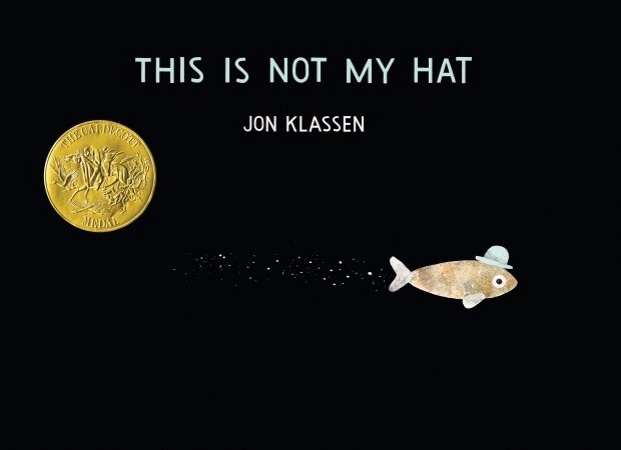 With the recent announcement of the 2014 Caldecott honours, I got to thinking about last year’s Caldecott medal winner – and one of my all-time favourite books – This Is Not My Hat, by Jon Klassen. It’s kind of an underwater picture book version of No Country for Old Men. A small fish steals something that doesn’t belong to him and – without any fanfare – is on the run from the big fish. There are no overt messages, no judgements of any kind. Just the inevitability of actions having consequences. Spare and suspenseful, this is a picture book par excellence and an amazing work of art. The underwater tableaux are reminiscent of the way painter Paul Klee creates surreal scenes from simple blocks of colour. And then there is Klassen’s sly humour, found in the counter play between words and images (we hear the little fish say he’s sure the sleeping big fish won’t wake up just as we see a large eye opening). No matter how you imagine the story plays out in the dense foliage of the final spreads, I think we can all agree the fish looked pretty darn sharp in that hat. This is Not my Hat, by Jon Klassen, published by Walker books, is available now.